The following article is also posted as a guest post on PediaStaff.com. Be sure to visit their website for innovative ideas, resources, and employment opportunities. Follow them @PediaStaff on Twitter for more information. When I was a boy, we didn't have graphic organizers. All we had was paper, pencils, and 20 minutes to write on a topic of the teacher's choosing. Okay, it wasn't quite like that. Actually, it was quite boring, tedious, and uneventful. So much so that I forget how I was taught to write paragraphs. Maybe it comes more naturally to students that don't have speech and language difficulties. Maybe not. I noticed as I got older that the standardized tests wanted to see pre-planning strategies to my written responses. Strategies? Hmm. I scribbled down some notes and wrote a rough draft in pencil. Then, I pretty much copied my rough draft to the final draft using a pen. Truly, it wasn't much pre-planning other than re-reading my work and checking for errors. Fast forward twenty some odd years later and now I'm the guy who is in front of the classroom trying to motivate struggling students to write. My first exposure to graphic organizers came at some sort of "brain" conference. The presenter suggested using them to teach vocabulary to students. My understanding increased, but my bag full of graphic organizers didn't come until a few year later when I was introduced to Sopris West's Language! program. I won't go into the entire program, but I will tell you that even today I continue to use several of their graphic organizers with students who are struggling with vocabulary and written language. If you can still find the program, my favorites are Define It!, Draw It!, and Map It! I'm guessing that this isn't news to you. Students struggle with writing--especially ones that have learning disabilities or language deficits. My mantra with my students is always, "Keep It Simple (and) Stupid" or as many know it--The K.I.S.S. Rule. My job, as I explain weekly, is to come in an make their lives easier; teach them what I wish I had known when I was in school. 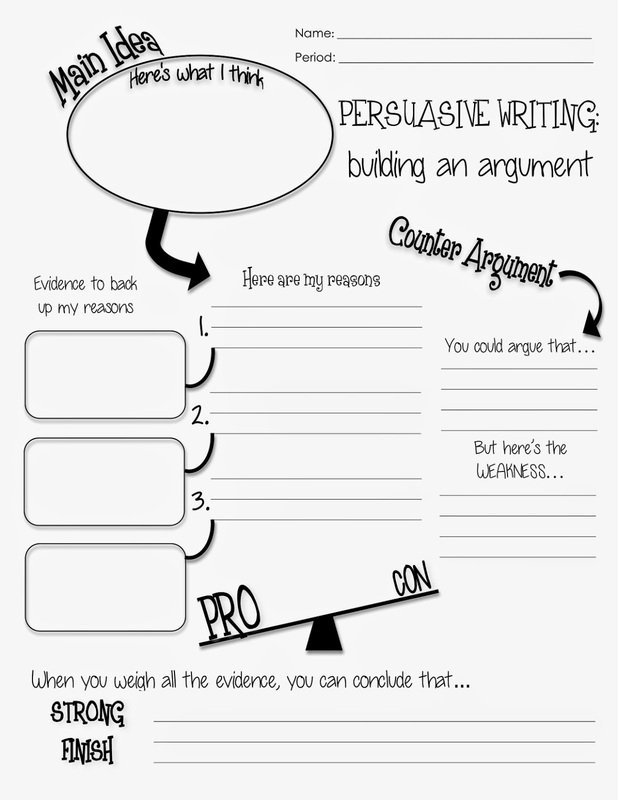 Whatever the task, there is a graphic organizer for it. You can use graphic organizers for defining words, writing (building) sentences, character mapping, multiple meaning words, story arcs, compare/contrast, summary paragraphs, Venn diagrams, cause and effect, note taking, five paragraph essays, setting and character development, making inferences, story boards, and sequencing -- to name a few. One of my favorite graphic organizer sites is www.freeology.com. Of course, you already know by its name, the best part is that it's free! I love their slogan, "Free Stuff for Teachers". Hook, line, and sinker. The website has too many to list and review. Go there, find what you like, and maybe contribute a dollar to their coffee fund for doing the work for us! Story Board - We use this to sketch out a summary of an article, paragraph or short story. You can brainstorm all of the events on the board and then have the students pick four (or more) main events to write about. Simply put--one event equals one sentence. Throw in an introduction sentence and a conclusion and you've got a 6 sentence paragraph! Vocabulary Sketches - This one is a great one for all kinds of vocabulary. We've used it for science, social studies, and literature. The students write a quick and easy (simple and stupid) definition and then draw a picture (an example) of the vocabulary word. Summarizing - I actually use a variant of this one, but this one is fairly simple and easy. We brainstorm all of the components on the board and then the students pick whatever is most important for their graphic organizer. After completing the outline, then they transfer the information into paragraph format. Organizer for Summarizing - So simple, yet so thorough. What's my point? No matter the task and no matter the level of student, we should be using graphic organizers to develop those pre-writing skills. They're not just for English class either. Science teachers and social studies teachers should be using them daily in their lessons too. Creating timelines, analyzing, comparing/contrasting. You name it and there's a graphic organizer out there for it!